The 808nm wavelength effectively penetrates deeply, and is absorbed by the target chromophore. The adequate pulse duration, energy density, and epidermal cooling ensure an adequate thermal damage to the target tissue, without damaging the surrounding tissue in order to achieve effective hair removal. 2. 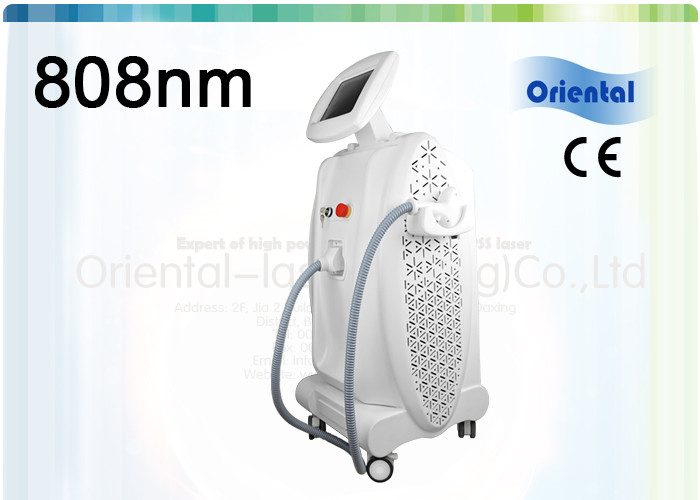 Safety: The 808nm diode laser hair removal machine is a Gold Standard product and features a reliable performance. There is almost no skin scattering, no harm will come to the skin and sweat glands, there will be no scars left behind, and there are no side effects. 3. Fast: The large spot size (10 x 17mm²), a 10Hz repetition rate, and a maximum output power of 600W ensures excellent effects and a fast treatment on the large treatment area using FHR mode (On-motion), as well as reduces the treatment time by 1/5. 4. Efficiency: An 808nm diode laser hair removal system uses the most advanced technology, ensuring the mechanism performance and making the clinical results both visible and safe. 5. No pain: A sapphire temperature cools the area to -5ºC, causing a temporary epidermal anesthesia. This means the treatment is painless and comfortable. 6. Components: An intelligent 10.4" touch display screen is included, and is easy to operate. 7. Long laser width: The laser width is effective for hair follicles in order to produce heat accumulation and permanent hair removal. 1. Permanent hair removal: This machine is suitable for all hair colors and is highly efficient. 2. 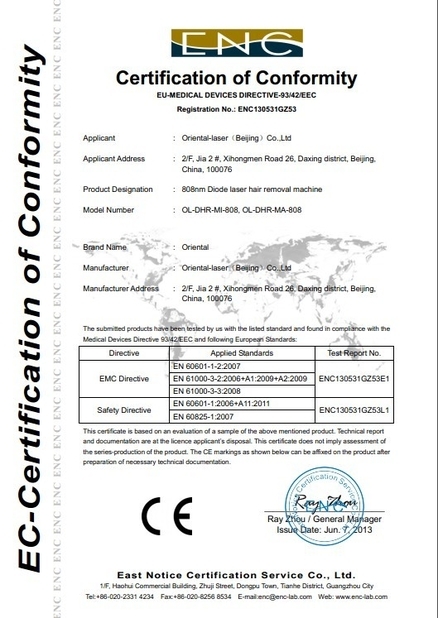 The 808nm diode laser handle is optional. 3. Advanced technology: This beauty product uses the most advanced thermostatic water cooling system: water cooling coupled with semiconductor cooling. The thermostatic water cooling system ensures a long service life. 4. More than 10 million shots ensure a longer service life over other hair removal machines. 5. Continuous working cycle: The energy density reaches a maximum of 120J/cm². 6. There is no pigmentation limit: the hair removal machine can be used on any skin type. 7. The terminator hair removal system uses a penetrating technology, which means skin absorbs less laser energy. 8. Self-checking and auto-protection mechanisms ensure the stability of the machine. 9. An advanced continuous wave method provides homogenized energy on each pulse. 10. An optional hand piece comes with a German laser module. Our company Oriental-laser is major in higher power diode lsaer production, we offer both diode laser hair removal OEM system and diode pumped solid state laser system. 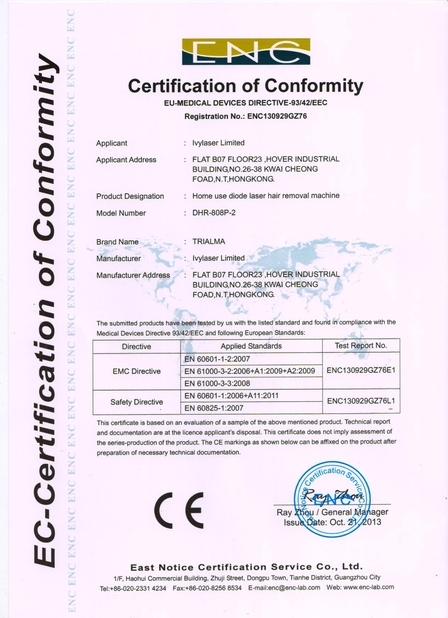 Products widely used for industry,medical&beauty,research and defense areas. Welcome to Beijing Oriental laser!